Episode 3 of the Full Force Series 2 podcast is now online! With Roll Out Roll Call just around the corner, the boys discuss the finer points of the show in what is definitely one of the sexist episodes we’ve ever produced….not the sexiest!! It what should be some very simple news segments, Dave, Eddie and Chris get deep and meaningful in discussions that will amaze and shock….not really….just bigging it up!! We look at Raginspoon’s upcoming exclusives for the con and delve into the same characters from those exclusives in the figure review and from the vault. We top it off with the most ridiculous ‘what we got in’ section as Chris barrel-rolls into, what can only be described as, a plastic crack addiction!! So, join the boys with the toys as they put up ‘no girls allowed’ signs for the latest episode of the…….FULL FORCE!!! The Full Force podcast discussion! Read moreThe Full Force Podcast! 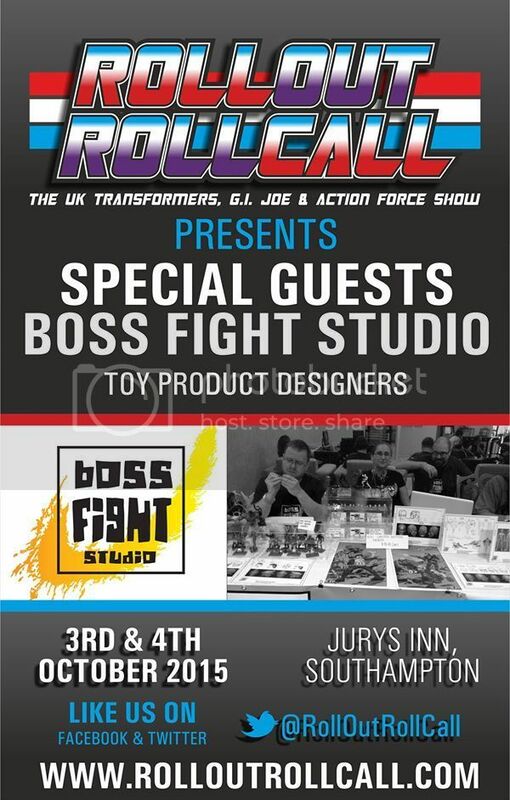 Boss Fight Studio at Roll Out Roll Call! Roll Out Roll Call is October 3 and 4, and they announced that Boss Fight Studio will be in attendance! So with the countdown begun, less than 8 weeks to Roll Out Roll Call, The UK Transformers, G.I. Joe & Action Force Show lets start treating you with guest announcements, more exclusive announcments, competitions, exhibits, panel presentations and more. First up, the incredible force that is Boss Fight Studio return exclusively for Roll Out Roll Call. This super team of toy sculptors and designers have helped create some of the coolest Transformers, G.I. Joe, Marvel and Star Wars action figures in recent years, as well as the recently launched Marauder Task Force action figure line. They have their own product due for this year, the amazing Vitruvian H.A.C.K.S action figure line which will push the benchmark in 4″ action figure design. Meet some of the team as they give you a little glimpse into the creative process in the toys you love. For the latest news, check out Roll Out Roll Call’s website, their Facebook page, their Twitter page, or sign up for their newsletter! Roll Out Roll Call discussion! Read moreBoss Fight Studio at Roll Out Roll Call!